In the previous segment we discussed how content format (audio and video) and adjustable rates of consumption were keys to maximizing our IPM. So let’s talk about content selection and content insight density. Picking the best content is the number one way to learn the right things faster. Remember there are over 300k books published in the US alone each year. We only have so much bandwidth. So say you got some great recommendations for learning about finances. The next thing to consider is the content insight density. If a book only has one or two core ideas, do you really need to read 300 pages? This is where the magic of layering comes in. Layering helps both with content selection and content consumption. You can eliminate many books just by reading descriptions and reviews. Maybe it is an idea you already understood or just doesn’t seem worth the time. If it is worthy, you can often find a summary of the book that gives you the key insights in under 10 minutes (services like Getabstract and Blinkist). That is a huge time saving. Perhaps you want to go deeper. You can often find a talk by the author and listen to it at 2x speed. Finally, if the book has really high insight density or you need more explanation, grab it in audio format and listen at 2.5x speed. That takes an 11 hour book down to 4.4hr. These time savings allow you to consume a lot more insights than you ever imagined. So to be sure you get the most out of your time you want to be able to remember it. Here are the key pillars of memory. Externalize memory: By summarizing the information you have an external format that can be used for a quick review later. Do something with the information: Summarizing is a great activity to put content in your own words and capture the insights that are most important. Relate the information to other information: This leverages other memories to make the new memory stronger. Get enough sleep: We form long-term memories when we sleep. The best science says you need somewhere between 7 and 8 hours of sleep to do this effectively. You will be surprised at how much more creative you are when your subconscious mind can parallel process over a larger set of long term memories. In summary, to gain a personal learning advantage, focus on insights per minute through content selection, content format, content insight density, and content consumption rate. 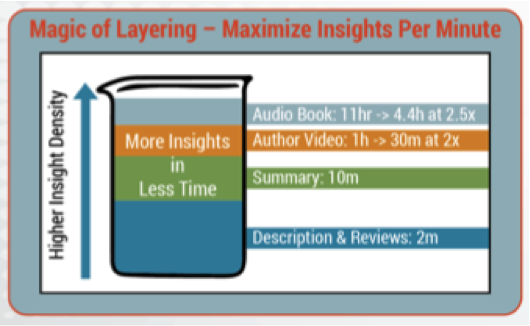 Remember the magic of layering to consume more insights faster. Remember your ABCs: Always be Capturing, Connecting, and Compressing. Use the 4 pillars of memory to your advantage (externalize, do, relate, sleep). These tools together can make you a 10x learner and help you gain a personal learning advantage. If you would like to find out more check out the book and the service that implements the book.